Last weekend I spent four days in Chicago starting on Thursday. I had no internet access so I could not post my photos of the day. I thought that today I would post a couple of pictures from each day. I really had a lot of fun shooting in Chicago. I really went the tourist route this time, but there was a lot that I had not yet seen. Next time I might dig a little deeper into the city. For my first shot of the city I thought that I would pick this one. 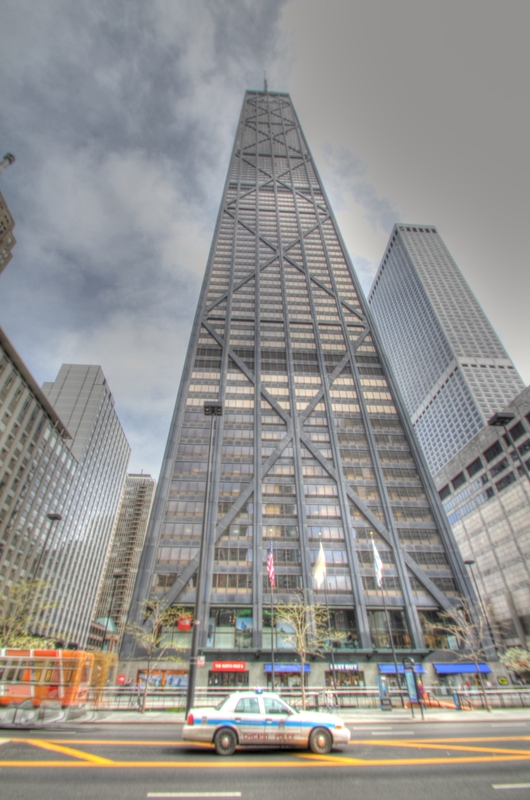 It is of the John Hancock building which is one of the iconic buildings of the city. Right in front of the tower is a parked Chicago Police car that really added some local flavor to the picture. This is a six shot HDR that is not perfect, but I really like how it turned out. I will post more pictures from my adventures this weekend on my Pinola Photo Facebook page. For now though I have the task of catching up on a few days of this project.